Wil Wheaton and I just won an Audie Award for the audiobook of Fuzzy Nation. That’s fantastic, and I am absolutely thrilled to share the award with Wil. He’s such a fantastic reader and friend. I should, like, dedicate a book to him one day. That he might then narrate. Or would that be too meta? Today has been flat-out the most interesting — and ultimately the most gratifying — book release dates I’ve had, and a lot of people are responsible for it. As a recap for the folks who need recapping: My new book Redshirts came out today, and in its eBook format it was supposed to go out without digital rights management added to it. But when the book was released we found out that several of the major online bookstores had (for whatever reason) swaddled the book in DRM, contrary to our desires. Readers informed me, I informed Tor, Tor’s digital folks went into overdrive, both talking to the retailers to get the DRM switched off, and offering DRM-free replacement files for the people who had bought the book with it switched on. All within the space of hours. Redshirts going out with the DRM switched on had the potential to be, bluntly, a major screw-up, but at the end of the day I think it turned into a textbook example of how to address a potential problem head on and fix it quickly and fairly for readers and buyers of the eBook. To that end, I have people to thank. First, thank you to everyone, here and on Twitter, who quickly reported about when and where they found DRM’d copies of Redshirts. It allowed me to give a usefully complete picture of the problem to the folks at Tor. Second, thank you to my editor Patrick Nielsen Hayden, who found about the problem for me pretty much at the moment he woke up, and who started working to fix the problem roughly half a second later. Third, thank you to Tor/Macmillan’s digital folks, and in particular Hillary Veith and Daniel Schwartz, who made contacting the retailers and offering an easy e-mail fix to affected readers their priority for the day. Fourth, thanks to those retailers who helped to resolve the issue on their end and especially those who will follow up with their customers, so they can have the DRM-free experience they were promised. Finally, thanks to Tor and to Macmillan for moving at unheard-of speeds to fix the problem. From my point of view, this wasn’t just a technical issue, this was my book, bought by my readers, on its release day. To have the problem recognized, addressed and solved within hours was a huge relief to me, and also showed that Tor/Macmillan are serious about this DRM-free initiative of theirs. That makes me happy, and I think should make readers happy. And now I am going to have a cookie. Maybe even two. I deserve them, damn it. I’m no longer at the Javits Center with its horrible dystopian wifi, and after a small break I’ll be off to have dinner with friends. Because friends are cool that way. So to keep you busy, and because by now I’m sure you’re not tired of me talking about Redshirts, here are three new reviews for you to look at. Redshirts both realizes and transcends its premise, and is at once a tribute to, and a piss-take on, the best and worst that space opera has to offer. I sat down and did something I almost never, ever do: I read the whole thing through. I mean it; I found myself voraciously consuming the book. It’s a science fiction novel that in many ways is a parody of “Star Trek”, but to think it’s just that is pretty unfair. Redshirts is a quick read that’s full not only of humor, but also real emotion and thoughtful commentary. I’ve had an interesting day; hope yours is going well too. 1. Send a copy of your receipt to “redshirtsdrm@macmillanusa.com” and specify if you prefer mobi (kindle) or epub (everything else) format. 2. They’ll send you a drm-free replacement copy in an email. I’d say more but I’m in the bowels of the Javits center with almost no Internet. But this gets to the point. Today and tomorrow morning I am doing Redshirts-related things at BEA here in New York City, but tomorrow evening, June 6 — at 6:30! 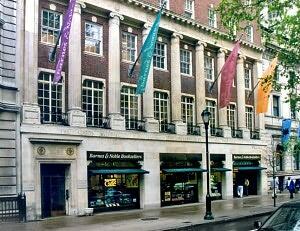 — I will be at the Barnes & Noble at Rittenhouse Square for the first public appearance on my book tour. There will be readings of upcoming work, special awesome guests and if someone dares to bring a ukulele, I may even sing “Redshirt,” although I probably won’t then mime being consumed by a Borgovian land worm. Probably. Also, of course, I will sign all your books. Even the ones I didn’t write. Because, you know. Why the hell not. So, Philadelphia: Come see me! You’re going to come see me, right? Oh god please come see me. And bring every other single person you’ve ever met in your life. We’ll have fun. Promise. 1. Tor Books (and my) intent is to sell the Redshirts eBook DRM-free. 2. If you have a Redshirts eBook that has DRM on it, it’s not something that we asked for or want. 3. If for some unfathomable reason your preferred vendor has put DRM on your copy of the Redshirts eBook, I’m just gonna leave this here for you. 4. Feel free to complain to the retailer in question about adding DRM, and point them to this entry as evidence that their DRM is going against my and Tor’s wishes for the eBook. At the moment, it does appear Amazon is selling the eBook DRM-free; it’s nice that the largest online retailer in the world, at least, has clued in. Sorry about the glitch. Please do remember that Redshirts is the very first book from Tor meant to be sold without DRM on it; there are bound to be kinks in the pipeline. We’ll get them worked out. Have patience and a little faith. Thanks. The irony here is that when I talked at Tor’s presentation yesterday, I noted that one of the problems of DRM from a writer perspective is that we have to act as frontline customer service about it. This is exactly what I’m talking about. I won’t miss it. Update, 7:30 am: A note from Patrick Nielsen Hayden at Tor telling me that this will be the first thing that’s addressed by Macmillan’s digital publishing folks today. He also says, and this is a direct quote, “This will be fixed and that we’ll make this right with everyone who’s been affected by it.” Told you we were on it! So, I have a new book: Redshirts. Today, June 5, is the official release day here in the US and Canada. 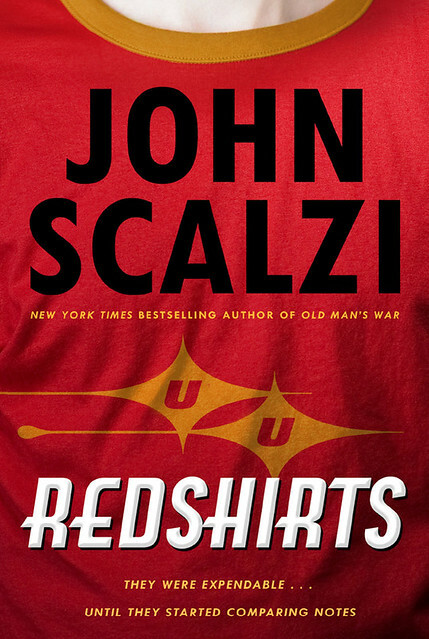 If you are in the US or Canada, you may walk confidently into your local bookstore, say to the proprietor, “Why hello, I would like to purchase the new book Redshirts, by that fellow John Scalzi,” and they will say “But of course. Here it is. Enjoy it in all its red-jacketed glory.” Likewise, should you wish to purchase the book for yourself or others in the glorious eBook format, you may do so jubilantly, without the dreaded confines or shackles of digital rights management. Or you can choose to have it read to you, in dulcet tones, by the estimable Wil Wheaton, in the audiobook version. Truly, this is the best of all possible worlds. On this, the day of the release of the book, let me tell you what my own plan was for this book when I start writing it: To have fun with it, and to have you have fun with it. I wanted to write something that was unapologetically a blast to read, that was also unapologetically funny — I’ve written enough novels with humor in them that I felt it was finally time to come out of the closet, as it were, and write one for which being funny was a primary goal. I think there’s more to it than just humor, particularly in the three “coda” short stories that follow the novel proper (as I’ve noted before, Redshirts as a book is a more than just a single novel). But at the end of the day, the first thing Redshirts wants to do is make you laugh. I hope it does. I’m not going to lie to you: I’m tremendously proud of this book, and I really, really want you to read it. I don’t think you will be disappointed. For all of you who preordered the book and helped to make my publisher (and me!) already very happy with early sales: Thank you. You are fantastic. To everyone who decides to pick up the book — I hope you love it, and if you do, that you’ll tell folks about it. You telling your friends about it is the best advertising I could possibly get. So thanks if you do. Happy reading, folks. You’re going to have fun with this one.